Hazel “Ruby” was born Friday, May 13, 1927 in West Luther Township, Ontario. Her father Clarence Wilbert “Roy” Culp was born 16 August, 1902 in Conn, Ontario (and died on June 8, 1984). Ruby’s mother Hazel Speirs (Large) Culp was born on June 30, 1906 in Hamilton, Ontario (and died in 1999). They were married in Hamilton, Wentworth, October 31, 1925 by a United Church minister. Their witnesses were Norma Culp of Damascus and Archie Cranston. Both are buried in Fairview Cemetery, Acton, Halton Hills. The Culp family lived on a farm but never really farmed. Ruby was the eldest child, followed by Bernice and Blanche, identical twins, born in 1929. Brother Ross was born in 1930 and baby sister Jean born in 1940. It is interesting to note that Jean was also a twin but her twin never survived and Jean herself died young of cancer. As each child was born Ruby moved further and further into the background. By the sixth grade Ruby was finished with school. She then stayed at home to look after her siblings as her mother went into the bush to work with Ruby’s father. Having vowed never to marry a farmer as they never made enough money, Ruby ended up doing just that. Her husband was Stanley Alexander Hartley Corbett (born December 29, 1912) and they were married June 10, 1944 in Erin, Ontario. Their signing witnesses were her aunt Mirle Culp and sister-in-law, Margaret Pritchard. The officiant was a United Church minister. Ruby and Stan had two children, William “Bill” Alexander born in 1945 and Beverley Ann on August 12, 1948. The Corbett family lived on a farm and worked the farm. Stan also worked off the farm in a lumber mill while Ruby stayed home with the children. Once the two children were married she went to work at a number of retail stores as well as a nursing home. Sadly, Stan died September 3, 1987, and is buried in Erin Cemetery, Erin, Wellington County which is where Ruby will be buried. Ruby and Stan lived on the farm in Erin Township for many years. After Stan’s retirement, they moved into the house her son Bill had previously built on a severed portion of the farm. A few years after Stan’s death Ruby then moved from the country onto Daniel Street in Erin. She lived there until 2011 when she made the move to Chesley and eventually into the Islay House. Ruby loved to sew, knit and quilt. She made clothes, toques, mitts and scarves for Beverley and her grand-daughters and great-granddaughters. This ability was not handed down to her daughter or granddaughters but Ruby did teach it to one of her great-granddaughters. Ruby collected porcelain dolls, a hobby that started when her children were young. She was not much of a traveller but did venture down to Branson, Missouri with one of her sisters. Ruby was comfortable with what she knew and with what was familiar. Ruby had a few dogs, cats and birds throughout her years. “Tippy” and “Willie” were amongst some of them. She liked to watch TV – all the oldies but goldies, i.e. Little House on the Prairie, The Waltons, Murder She Wrote, Matlock, Lawrence Welk and old western movies. She enjoyed her AMC TV channel. She loved to watch and listen to Daniel O’Donnell and also enjoyed old country music like Johnny Cash and Jean Sheppard. Ruby was not much for socializing before she moved to Chesley, although she did have a few good friends in Erin. It was only after moving to Chesley, and later in her life, that she became more outgoing. Ruby was frugal, of course, given when she was born and raised (during the Dirty Thirties and WWII). However, she did allow herself to indulge sometimes and enjoyed ginger ale and when she was younger – fresca. Ruby never smoked or drank alcohol. Although cooking was not one of her favourite things to do, her chili sauce was her best creation! 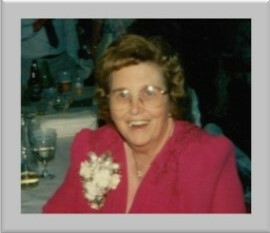 Hazel “Ruby” Corbett of Chesley, formerly of Erin, passed away after a brief illness on Saturday, April 6, 2019 in her 92nd year. Mother of Bill (Ethel) of Powassan and Bev Sanderson of Port Elgin. Cherished grandmother of Wynne, Hugh, Daisy, Emmerson, Carrie, Steve and Darcy. Ruby will be missed by her eleven great-grandchildren, four great-great-grandchildren, sister Bernice Moore and brother-in-law Gord Corby. She was predeceased by her husband Stanley, great-grandson Joseph, son-in-law Bill, sisters Blanche Corby, Jean (Tom) Vicory, brother Ross (Rose) Culp and her parents Roy and Hazel (Large) Culp. Visitation will be held at Rhody Family Funeral Home, Chesley on Friday, April 12, 2019 from 1 p.m. until the time of the funeral service at 2 p.m. Spring interment in Erin Union Cemetery. Memorial donations to Canadian Cancer Society or a charity of your choice would be appreciated as expressions of sympathy.